I travel to reunite with my friends. In 2013, I attended a farewell party for my high school classmates who were leaving for Brazil. I was surprised by how naturally I kept saying “I’ll see you again in Brazil!” just to lighten my friends’ mood, but eventually I did end up flying to Brazil to visit my three friends. It was the first time I left Asia. 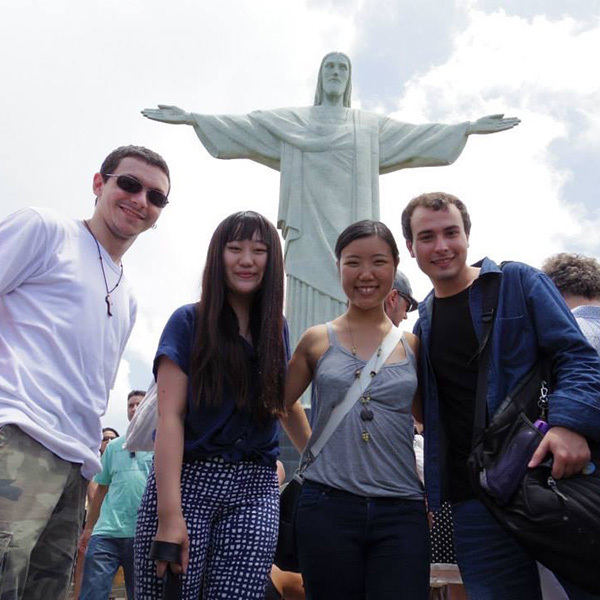 My friends showed me Sao Paulo, Rio de Janeiro, and Santos. For two weeks straight they showed me an amazing time from morning to night. We visited The São Paulo Museum of Art which was built by my most respected architect, Lina Bo Bardi. Bardi was born in Italy in 1914 and chose Brazil as a migrant country in 1946. “When one is born, one chooses nothing, one just happens to be born. I was not born here, but I chose this country to live in”. Bardi dedicated her democratic works and her love to Brazil, and became “Brazil’s most beloved architect”. I felt a strong resonance with her depiction of Brazil. “I never disregard the surrealism of the Brazilian people, their inventions, their pleasure in gathering together, dancing, singing. Therefore I dedicated my work at Pompéia to the youngsters, to the children and to the third age: all together”. It took me about 30 hours to get from Tokyo to Sao Paulo. I was shocked to realize that with just 30 hours and a suitcase I could be together with the people I love, wherever they are, and even now this fills me with a sense of liberation. 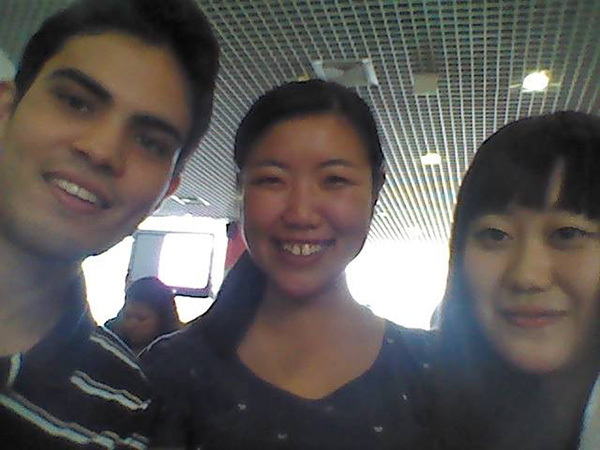 My friends from high school who studied at the University of São Paulo. 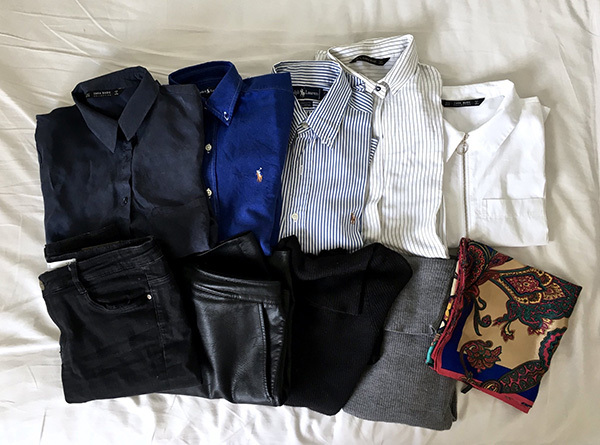 Having traveled and moved regularly, I’ve learned to live with minimal personal possessions, as well as how to pack a suitcase with them quickly. I like to organize my belongings by arranging the contents of my luggage side by side while imagining the journeys I’ll take with them. 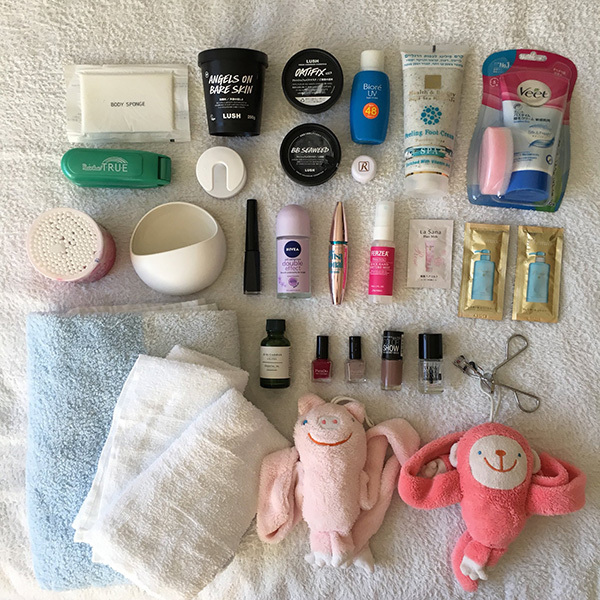 Even for a long stay, I pack everything into one suitcase by leaving behind many things. 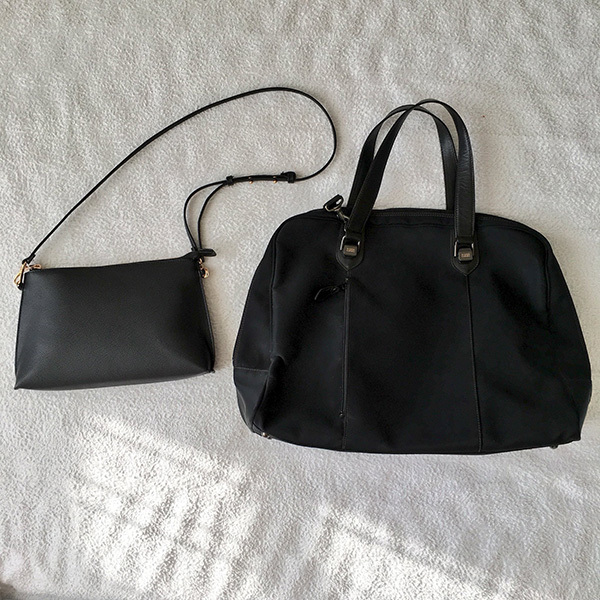 What I have come to understand through my repeated attempts at selecting my objects are the minimum necessities for my daily life: the things that I value, precious things I want to care for and use for a long time, or memories I do not want to let go. Some things are carried with me on every journey, some are just consumed, and some are brought only to be throw away at my destination. 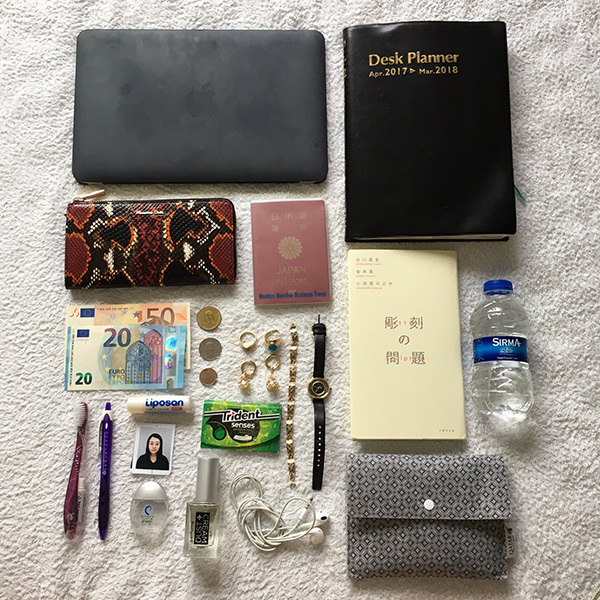 This is my baggage from when I stayed in Thessaloniki, Greece for 2 weeks for an archeological project in summer 2016. Having heard that the sunlight was strong in Greece, I added a scarf, hat, and sunscreen. Casual clothes and sneakers were added as well because we walked a lot in ruins. Laptop and iPads were handy to carry around for recording and researching for the project. 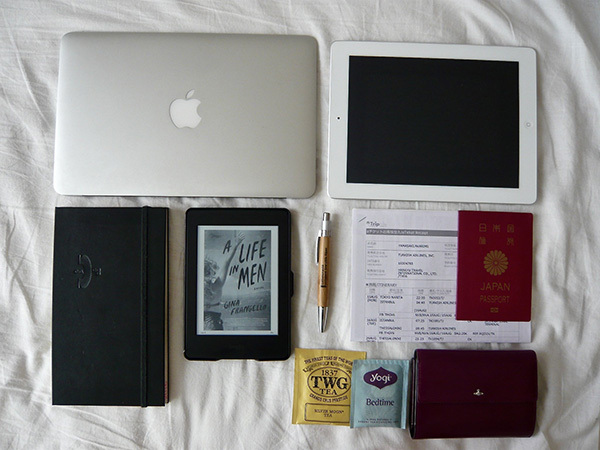 Since we spent a lot of time on buses, my Kindle was always in my bag, although I was sleeping most of the time… I was reading a novel called “A Life In Men” at that time. It is about two American girlfriends who travel Greece during summer in the 1980s. 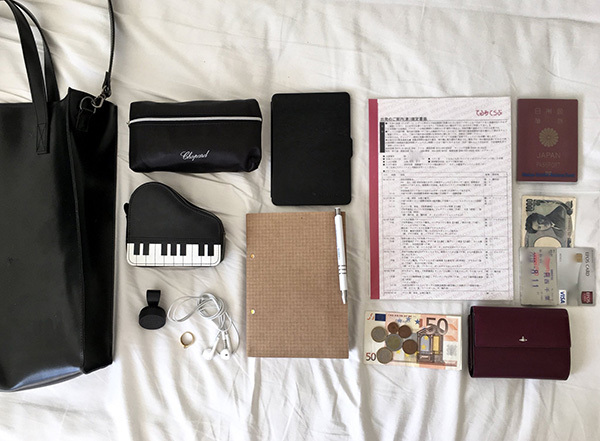 This is what I packed for a trip to several Eastern European countries with my grandfather, sister, and cousin in winter 2017. 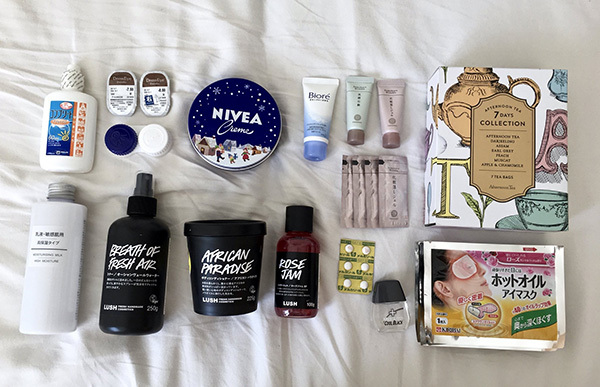 Because the air in Europe is too dry for my skin, I brought many moisturizers. 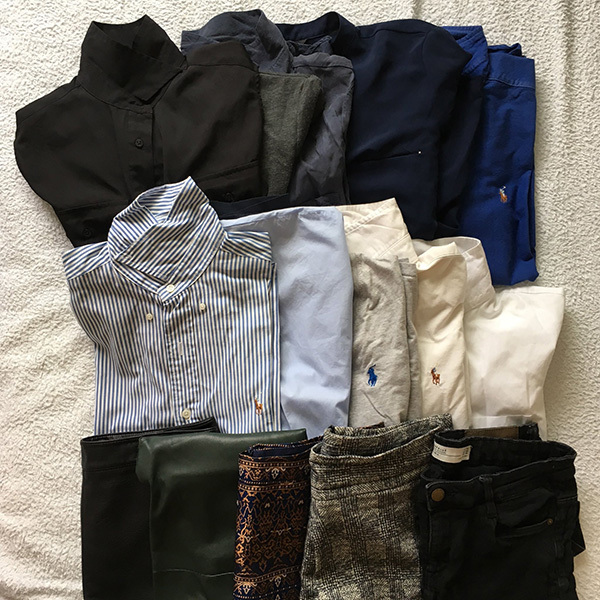 Shirts designed with a gender-neutral style are always my favorite, especially Ralph Lauren’s ones with durable fabrics and Zara’s ones with unique designs. Gold rings, mementos of my late grandmother, are always with me. 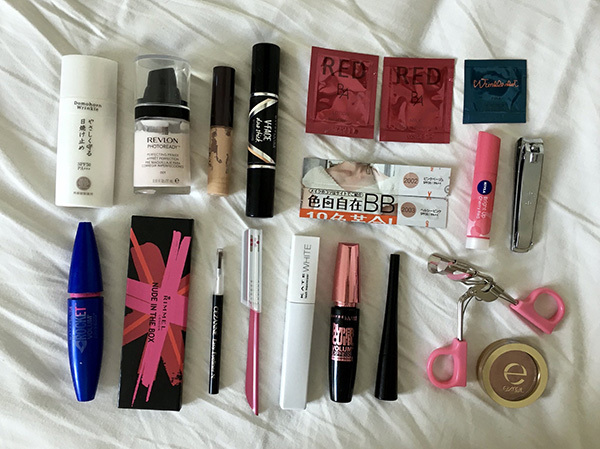 Sample cosmetics are saved up for traveling. Since Nivea’s blue can and steam cream can be used in many different ways, I’ll bring one along when I want to shrink my luggage down. 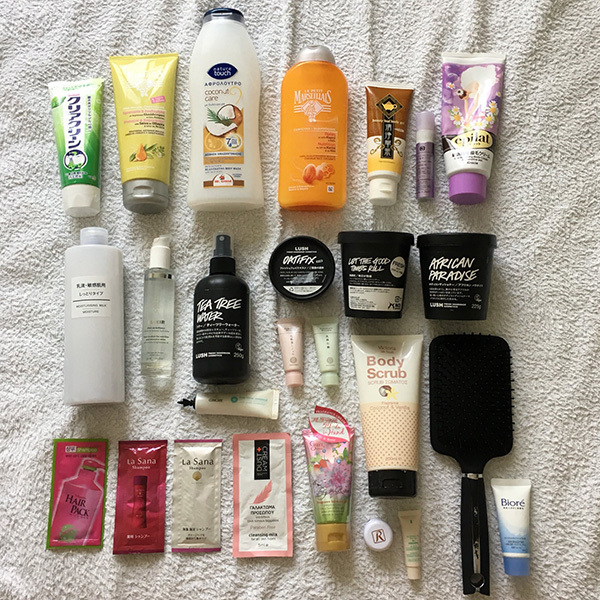 This is my packing from when I moved to Taiwan in fall 2017. 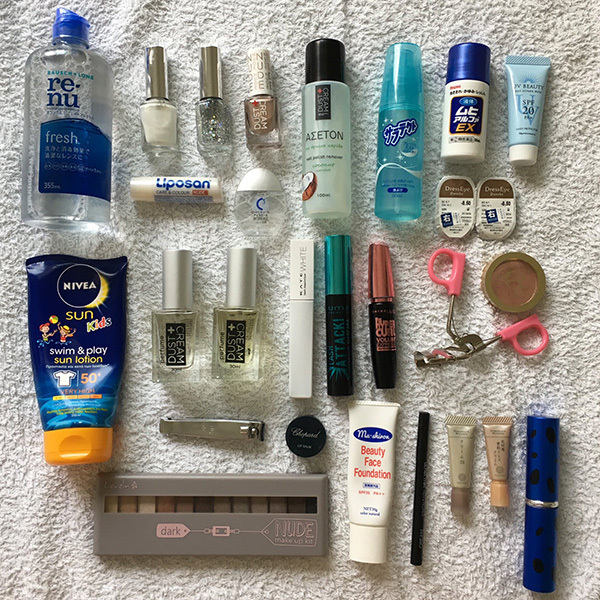 I packed all my daily necessities for at least two years into one suitcase. 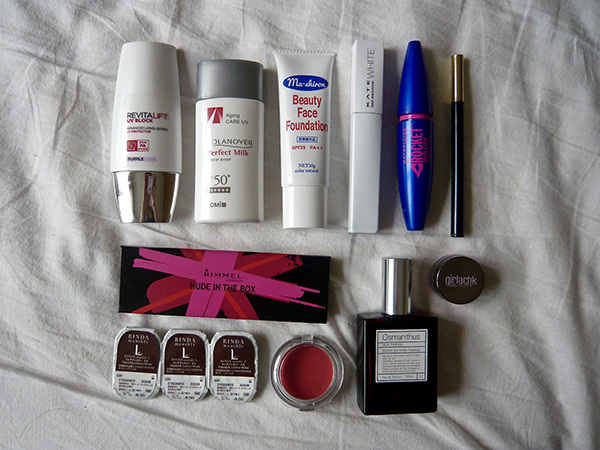 Since I was in Greece just before Taiwan, half of my belongings were Greek products. 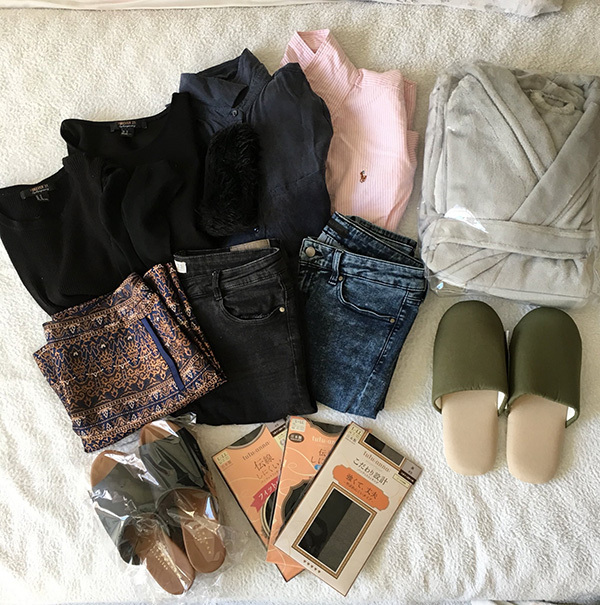 In order to reduce the size of my luggage, I mainly packed things that I would need to survive for three days, or things that cannot be purchased in Taipei. 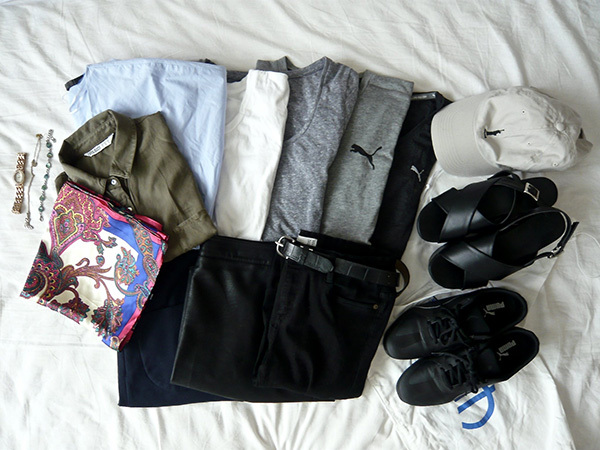 For clothes, I go with basic shirts and bottoms. There are many insects in Taiwan, therefore insect repellent and anti-itch cream are essential. For my makeup I need at least three mascaras. In May 2018, I went back to my hometown for a week to celebrate my mother’s birthday. This is what I brought back to Taipei. 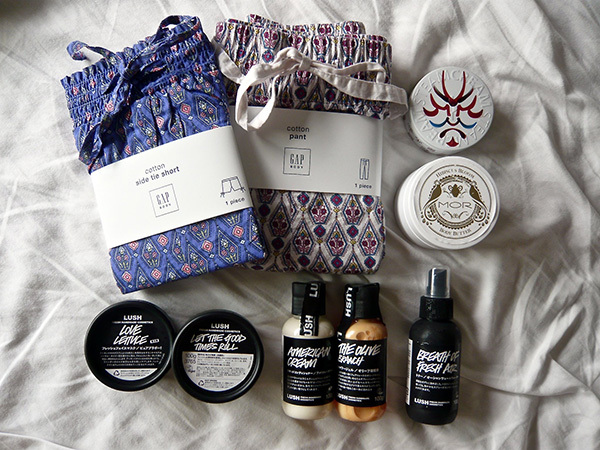 I have been using Lush skin care and hair care products for the last ten years, but unfortunately there is no store in Taiwan, so I bought these products in Tokyo. 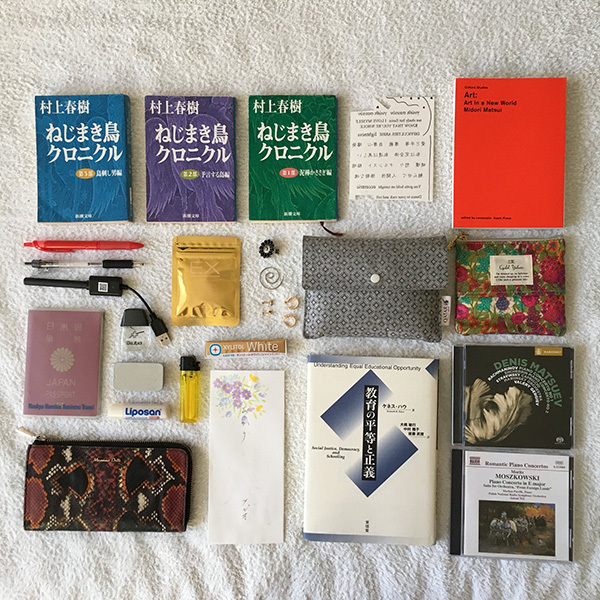 I also added gifts I received from my friends in Tokyo; classical music CDs, a pouch, and a scrub from the Dead Sea. I bought Murakami Haruki’s books at a secondhand bookstore in Jimbocho for only 50 yen. A book called “Understanding Equal Educational Opportunity: Social Justice, Democracy, and Schooling” was recommended to me by a philosophy of education professor at my previous university. The distances and differences between my home and my destinations have caused me culture shock. But for me, the reverse culture shock that occurs while trying to re-accommodate to my home is rougher and sometimes even painful. Whenever I go home, nothing has changed; it’s always the same. But something in my mind will have changed, and that change within me changes everything else. An American playwright, feminist, and activist Eve Ensler once said, “go so far away that you stop being afraid of not coming back”. I want to see how far I can go before I have to stop. I am not defined by where I am originally from or what has happened to me in the past, but I am what I choose to become. My roommate thinks that we are all sculptures that are never completed. People we meet along our travels constantly carve and shape us. We are sculpted by the combined efforts of everyone we have ever known. Observing, understanding, respecting, caring for, loving, and imitating the people I admire is the only way to go beyond my limits. I want to explore that threshold between being subtly modified by the people around me and not being changed by anyone at all. Packing a suitcase is a time to reflect on this, to quietly brace myself for the choices and changes I will soon have to face. The contents of my suitcase are the possessions that will sustain my life on a new terrain; they are a symbol of me.